It appears we’ll never know what killed L-112, known as Victoria or Sooke, found dead at 3 years old, after she washed up on an ocean beach in Southwest Washington. L-112 in happier times. The 3-year-old orca died in February 2012, and the cause of her death remains a mystery. 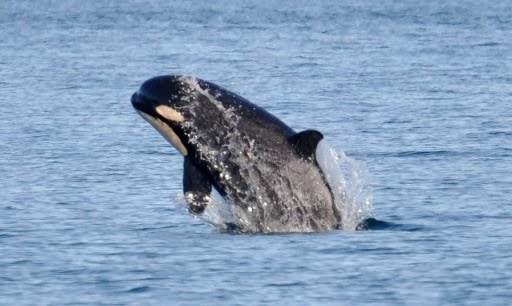 If you recall from two years ago, much speculation swirled around the notion that the female orca was killed by military operations, such as sonar or an explosion. The Royal Canadian Navy confirmed the use of sonar and small underwater detonations west of Vancouver Island. But that was far from Long Beach, where the orca washed up, and ocean currents suggest she was killed even farther south. For a quick history, see Water Ways from Feb. 18, 2012, followed by an entry on May 16, 2012. The latest report concludes, as early ones did, that L-112 died from “blunt force trauma.” But the cause of the trauma could not be determined. No sonar activity or explosions were identified in the area where her death probably occurred, although a physical examination was not able to totally rule out those causes. A new bit of information emerges from the long-term acoustic recorders that listen for sounds off the coast. Calls identified as coming from L pod were reported near Point Reyes in California on Jan. 30, off Westport in Washington on Feb. 5, and near Newport in Oregon on Feb. 20. L-112 was found dead on Feb. 11 after floating for several days. It appears likely that the young whale was with her pod at the time of her death. “This multi-disciplinary investigation could not determine the source of the blunt trauma despite gathering and evaluating all available information on the whales, the environment, and human activities. We evaluated the sighting history of the whales to provide insight into the circumstances of the stranding. “A major source of trauma from sonar, explosives, or a seismic event would likely have affected multiple individuals traveling together as killer whales are known to do. All other members of L-112’s family group were sighted following L-112’s stranding. No other members of the L4 sub-group were reported missing, injured, or stranded between the time of the L-112 stranding and the summer of 2012. Reporter Phuong Le covered the story today for The Associated Press. What matters most in underwater blast trauma is proximity to the explosion. Based on my observations in the San Juans, individual SRKWs are commonly separated by 10-1000 meters (with a strong dependence on their behavioral state). That range of distances brackets a HUGE range of trauma zones! For example, for a 1,200 lb charge (see final figure of Ketten, 1995) if L-112 was 50m from the blast while L4 members were 200m and other L pod members were at 1200m, Sooke/Victoria would have died, other L4 members would have lost >50% of their hearing permanently, and the rest would have only experienced temporary to no hearing loss. Reference: Ketten, Darlene R. 1995. “Estimates of Blast Injury and Acoustic Trauma Zones for Marine Mammals from Underwater Explosions.” In Sensory Systems of Aquatic Mammals, edited by Ronald A Kastelein, Jeanette A Thomas, and Paul E Nachtigall. Woerden, the Netherlands: De Spil Publishers. That is very interesting, Scott. I still find it confusing to think that the effects of an underwater detonation cannot be distinguished from a physical blow. I guess part of the problem is the physical condition of the body. There is a bottom line here, though it may not be easily found: If the cause of L-112’s death was something that a human did, then there is a human somewhere that knows what he did, and it’s not likely that he acted alone.